One day I got a call from a friend saying that he accidentally fed high voltage signal (line voltage) and broke one of the channels. My hunch is that since he didn’t feed kilo-volts into it, the damage is limited to the (front-end) attenuator (an expensive part). I had an extra unit lying around so I just swapped it for him so he can get it up and running. 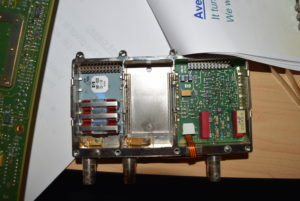 The 500Mhz attenuator used in 5461XB, 54505B/54506B/54510B/54512B (has to be version ‘B’), 54520/54540 series, and early Infiniiums 54810 series, E1428A (VXI board), 166XCS/166XES (MSO), 167XG-003, etc. are all the same: 1NB7-8303 (or 1NB7-8458). For 5461XB, it’s tucked inside 54616-68401*, which is a big metal case that covers 2 attenuators and an external trigger PCB (see the picture on the right hand side). Everything else is tucked individually inside 54512-63402 metal shield. In this autopsy, the resistive trace of 1NB7-8303 was blown open-circuit (charred), so bad that it spot-welded the metal casing. I took a good attenuator and measured resistance that the blown open ‘trace’ should have been. Turns out it’s a little less than 1Ω so I used 4-lead Kelvin sensing from my Agilent 34401A multimeter. I calibrated that meter using my Data Precision 8200 reference and agreed with my Fluke DMM, so hopefully I wasn’t way off. I could have put a small SMD resistor matching the resistance of the blown trace, but since I have a few back up attenuators lying around, I’d rather not risk the signal integrity by doing so, since I cannot guarantee the temperature specification if I just replaced it with a resistor. The scope was up and running in perfect condition after replacing the attenuator. Now you know what happens when you feed line voltage to a scope. The damage is usually limited, but the front-end (attenuator) is the most expensive RF part that makes a scope truly a scope (see Dave’s rant on EEVblog). The ADC hybrid can get just as expensive, but usually the attenuator takes the hit before your input gets to fry the ADC. * Be very careful about a similar looking block with similar number 54503-63401 or 54503-63402. It has the same metal housing, but inside the attenuator chip 1NB7-8116 or 1NB7-8288, which is NOT compatible with first generation Infiniiums, later 54500 series or 5461XB series. They are used in 54502A, 54503A, 54504A, 54510A. 54501A never showed up in the discussion because 100Mhz scopes does not need the individually shielded metal block. 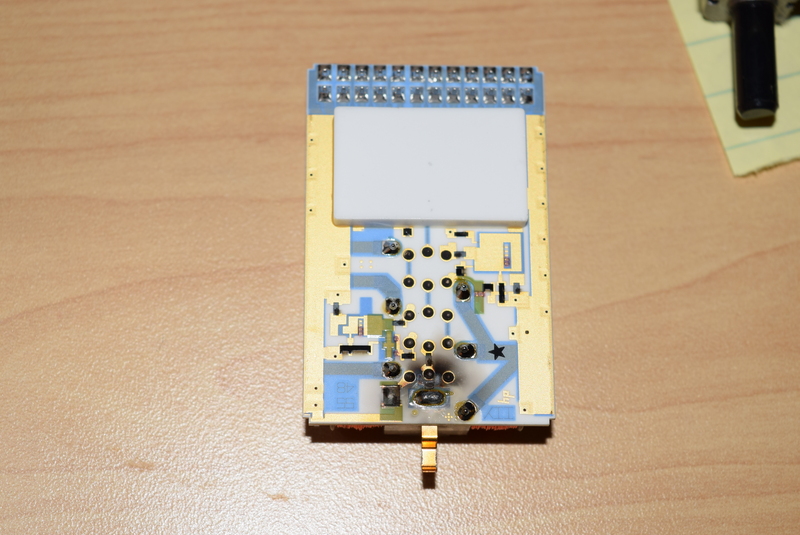 The attenuator was directly soldered to the main assembly.